From 41€ per night - 43 rooms of 4 types. Comfortable room for 1 person, recently renovated and equipped with a double bed. It also includes an en-suite bathroom with shower or bath, hairdryer, amenities and magnifying mirror. Also available: free Wi-Fi, telephone, desk, safe, air-conditioning, TV with international channels and wake-up service. This recently renovated room is ideal for couples and equipped with a double or Queen-size bed. It also includes an en-suite bathroom with shower or bath, hairdryer, amenities and magnifying mirror. Also available: free Wi-Fi, telephone, desk, safe, air-conditioning, TV with international channels and wake-up service. 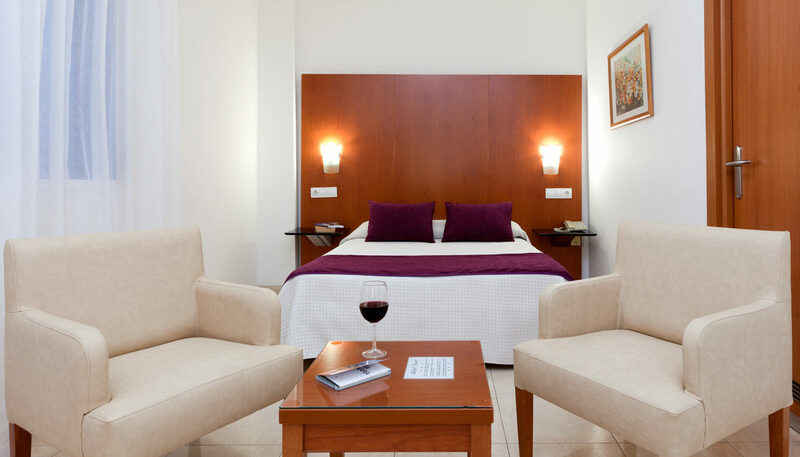 Comfortable room for 2 people, recently renovated and equipped with 2 large single beds. It also includes an en-suite bathroom with shower or bath, hairdryer, amenities and magnifying mirror. Also available: free Wi-Fi, telephone, desk, safe, air-conditioning, TV with international channels and wake-up service. Room for 3 people, recently renovated and equipped with 3 single beds. It also includes an en-suite bathroom with shower or bath, hairdryer, amenities and magnifying mirror. Also available: free Wi-Fi, telephone, desk, safe, air-conditioning, TV with international channels and wake-up service.